Katie Jarvis. 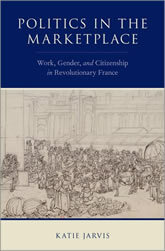 Politics in the Marketplace: Work, Gender, and Citizenship in Revolutionary France. Oxford University Press, 2019. Politics in the Marketplace examines how the Dames des Halles invented notions of citizenship through everyday trade. It innovatively interweaves the Dames’ political activism and economic practices to reveal how marketplace actors shaped the nature of nascent democracy and capitalism through daily commerce. While haggling over price controls, fair taxes, and acceptable currency, the Dames and their clients negotiated tenuous economic and social contracts in tandem, remaking longstanding Old Regime practices. In this environment, the Dames conceptualized a type of economic citizenship in which individuals’ activities such as buying goods, selling food, or paying taxes positioned them within the body politic and enabled them to make claims on the state. They insisted that their work as merchants served society and demanded that the state pass favorable regulations for them in return. In addition, they drew on their patriotic work as activists and their gendered work as republican mothers to compel the state to provide practical currency and assist indigent families. Thus, their notion of citizenship portrayed useful work, rather than gender, as the cornerstone of civic legitimacy.